The wind blows in a strong direction across the plains of Ohio in Jeff Nichols’s Take Shelter. Set among the ominous clouds, the landscapes of Mr. Nichols’s film seem to recall both the lost past of an untamed era, but also the possible future of a return to a land of restless violence. 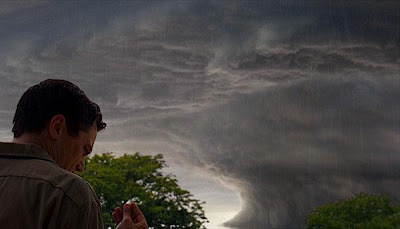 It only makes sense that the protagonist of Take Shelter, the good natured but easily corrupted Curtis, sees the visions of the end not in terms of fire and brimstone, but a storm of incontrollable magnitude. The past of both his own life, as well as that of the world he knows, is seemingly crawling back into his skin. And thus sets the stage for another great American drama with an independent and unique vision. 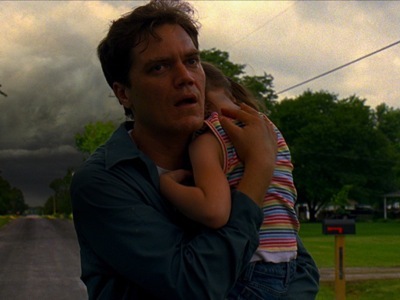 I missed Mr. Nichols’s first film, Shotgun Stories, which also starred Michael Shannon, but it’s an immediate catch for me now, as Take Shelter gives us an intimate look at one man’s battle with his own personal demons in a setting of Americana. Bathed with gorgeous visuals on this harsh plain, and supported by electrifying performances, Mr. Nichols had made a film that speaks volumes about our American psyche but through a truly personal story. Mr. Nichols began writing the screenplay around the time he began his own family, and that’s what centers this story of a small-town Ohio family led by Curtis. Curtis, lean and with piercing but loving eyes, works in a sand mine along the plains, supporting his beautiful and loving wife Samantha (a tremendous Jessica Chastain) and his hearing-impaired daughter Hannah. Their modest home sits quietly along the suburban neighborhood with an abandoned storm shelter sitting ominously in their backyard. Curtis seems just fine at the start of the film, but begins having visions of a storm that will destroy his life. First come the clouds, then the motor oil rain, and finally the lightning, tornadoes, and cannibals to threaten his daughter. At first, Curtis finds the dreams a nuisance that won’t go away, but as they begin to infect his waking life as well, he worries. Although aware that his mother suffered from schizophrenia at the same age, Curtis soon believes that his dreams are actually visions of a coming storm he must prepare for. But Mr. Nichols doesn’t let the intensity of the narrative make his film overly dramatic. His film may take visual cues from Terrence Malick’s Days of Heaven, but his understanding of human relationships is acutely aware of real drama. In a long scene in which Curtis explains to Samantha his visions, neither Mr. Shannon nor Ms. Chastain scream or shout, and the tears flow with reservation. As their dynamic becomes increasingly strained due to Curtis’s growing paranoia, their relationship changes and evolves, but continually demonstrates the power of love and trust that define them. And part of the power of the paranoia comes from Mr. Shannon, who gives one of his best performances to date. Although he’s played so called crazy types in films like Bug and Revolutionary Road, but with Mr. Nichols behind the camera, the actor restrains himself to smaller moments of epiphany, holding his predicament internally as much as possible. In one astonishing scene, Curtis looks upon a dance of lightning in the sky, and asks aloud “Is anyone else seeing this?” His answer is not a scream but a quiet ask for solidarity in his desire to understand the changing world. And it’s that sense of uncertainty that the end could come at any age that makes Take Shelter a calm and collected take on our American subconscious. No doubt Mr. Nichols set his film among the working class in a state where jobs are rapidly shrinking, and health care costs rapidly rising. Curtis’s visions may not come true, but they do affect the way he approaches his own masculinity, something he tries to preserve through emotional reservation and a strong temper than cannot stand. My one fault of the film comes in its ending, which attempts to provide an ambiguous statement about the realities of the narrative, which makes neither logical nor emotional sense. I’m still struggling over why exactly Mr. Nichols went with it, especially considering the film had its emotional climax three minutes before. That being put aside, few American films this year will speak as well as Take Shelter. Anchored by its performances, Mr. Nichols has made a film that sinks you into a story about mental illness and apolcayptia. But unlike a few of the other end-of-the-world schemed films from this year, Take Shelter seems completely uninvolved in its vision of what may happen, and much more worried on what is currently happening.